First you’re going to need to know what you want to build. Should be easy to choose, there’s only an infinite number of possibilities out there for you! 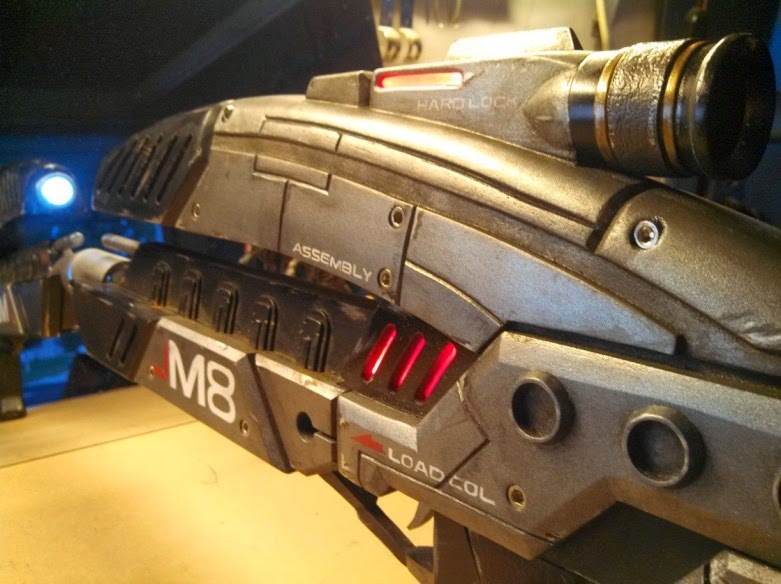 Mass Effect weapons are still a very popular commission for my shop, so I’ll be using the M8 Avenger from Mass Effect here. 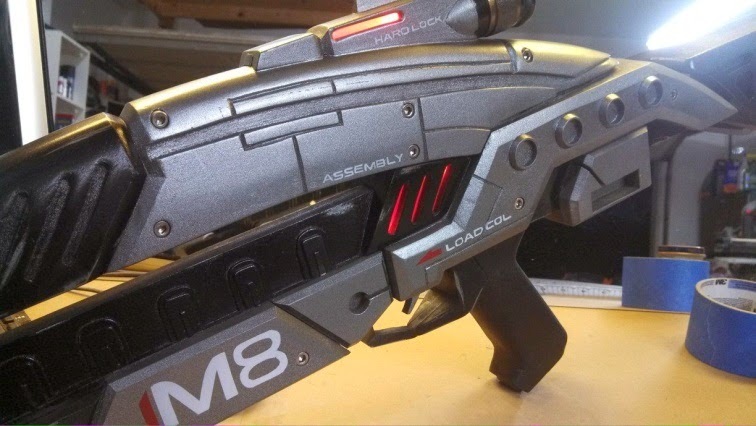 This particular build included a moving trigger and LED lighting. 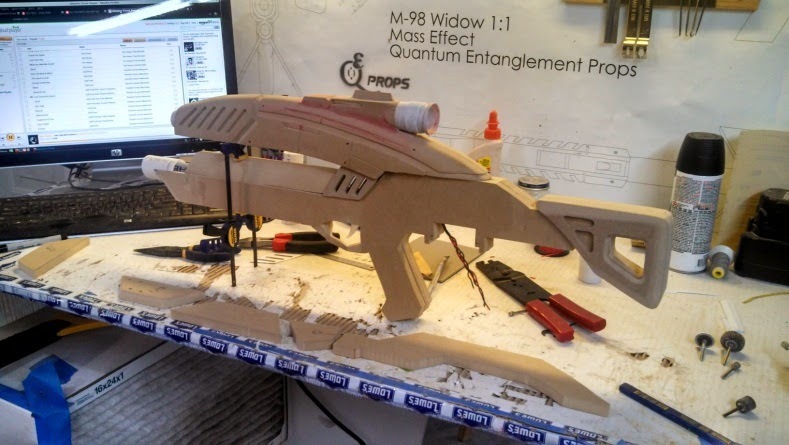 If you can’t find an actual blueprint of the prop you want to make, a side view of the weapon works nearly as well. Scaling it to the size that you want may take a few tries but it’s well worth the time. Above I have used the side view of the N7 Hurricane to make my trim templates. 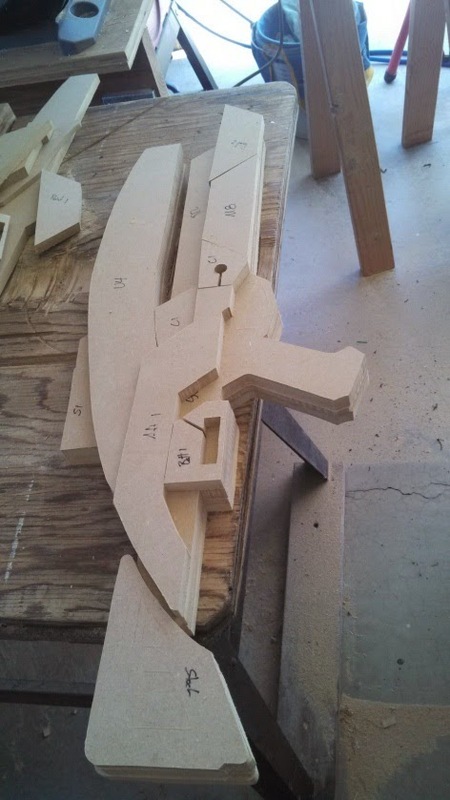 They’re all marked on the MDF board and the pieces are cut out one at a time. 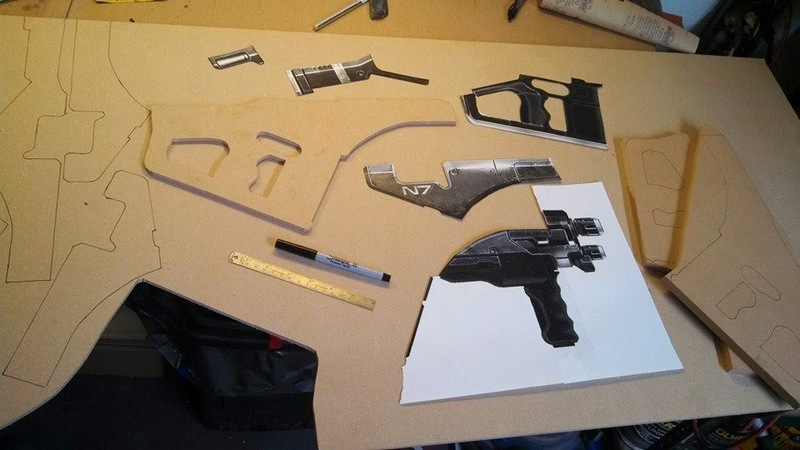 Once the pieces are all cut out, you have a pretty good idea how big the finished prop will be. Label your pieces so they don’t get lost or accidentally thrown away thinking that they’re scrap. 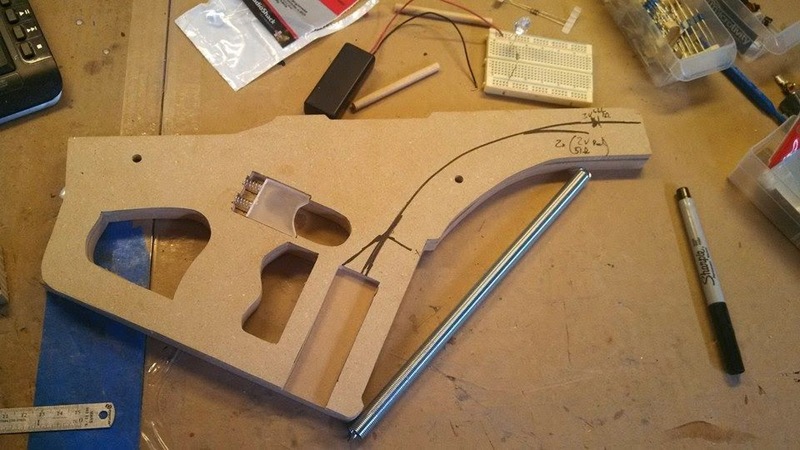 As I started assembling the prop I’ll make a notch in the center layer for the trigger and springs to sit. I’ll also use this opportunity to mark where the battery pack, wiring, LEDs, and switch will be. These paths will need to be routed out to make room for the wiring and components. I usually drill holes in line through the main body for guide pins. These pins allow me to repeatedly install and remove the layers to make sure they fit together and line up nicely. Lighting and wiring is done in sub-assemblies. 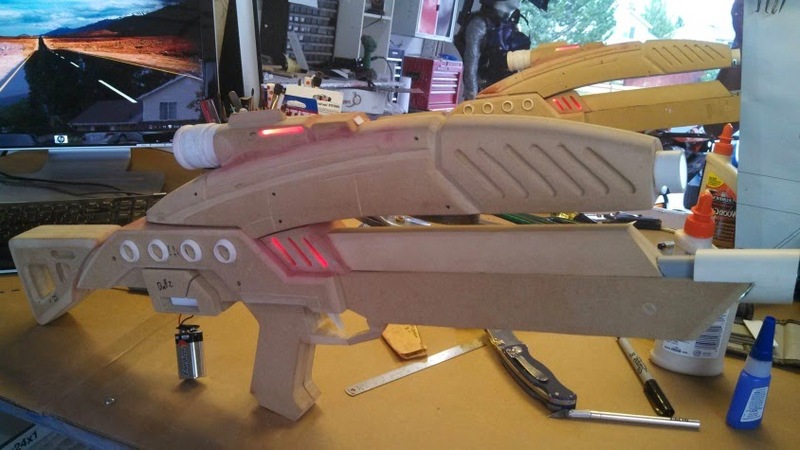 Here the upper barrel and scope are fully finished with enough wiring sticking out the bottom to run it through the main body to the switch and battery pack. The lines in the side of the body are done with hobby and utility knives, chisels, and files. There’s really no easy way to do these, it just takes time and patience. Each of the black dots are locations where I will later drill holes for the “assembly” screws. The internal areas are the hardest to do. Areas like the back of the stock that pass all the way through are easiest to do after the layers have been glued together. Round files are the best tool I have found to finish the corners. Continuing through the assembly, making sure that the wires are long enough to work with when it’s time to solder. The barrels, scope, and side rings are made from PVC tubing. A lot easier than trying to make a piece of wood round without the use of a lathe. Styrene sheet is used to make the flat details, and the texture sheet that is wrapped around the scope ring. 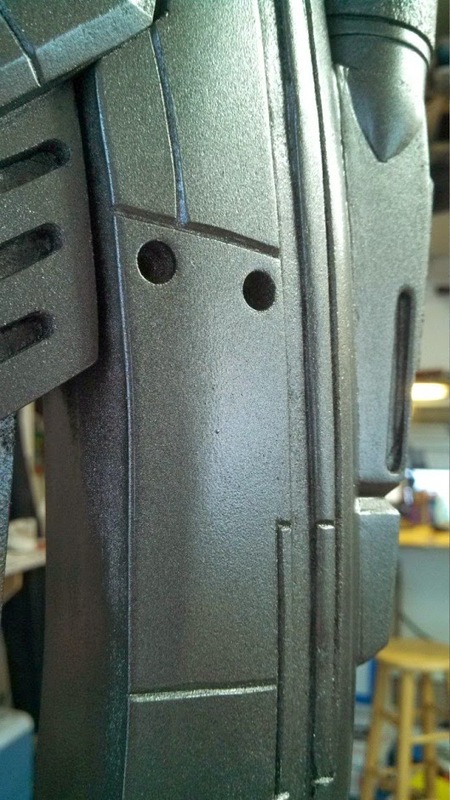 After the grip and stock areas are completed, I like to use a textured spray paint. Most guns have a texture on the grip and stock to help keep the weapon from slipping. 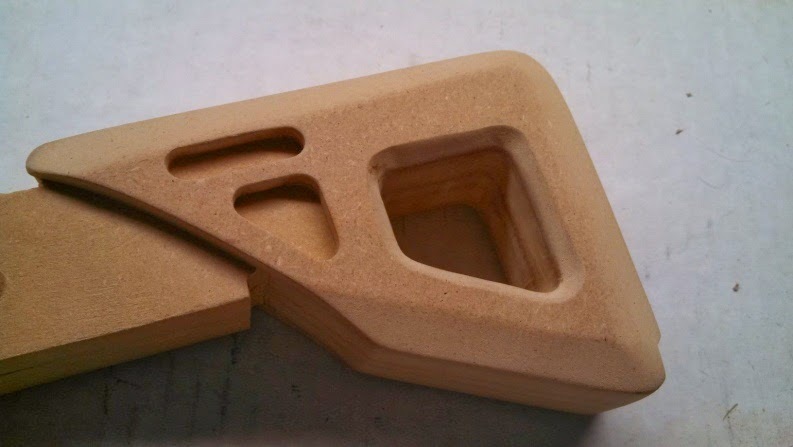 And in the case of the MDF it also helps hide any areas that you may not have sanded perfectly. You can also see a few areas on the upper body where I have started using spot filler to make a few repairs and fill gaps. Spot filler is nice to work with on small holes and it dries faster than body filler. 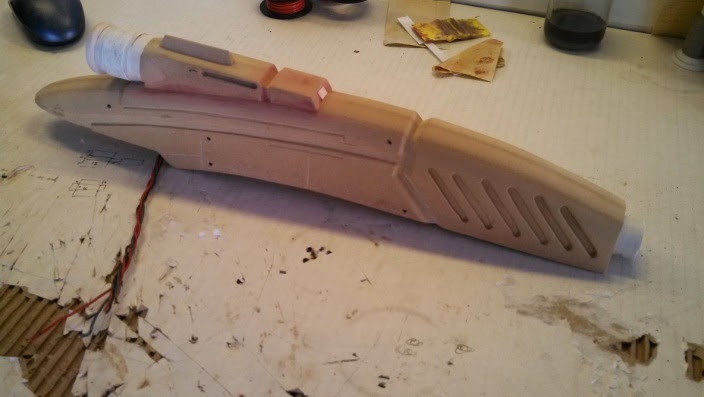 All those hours of sanding will pay off when you get to paint. A nice clean coat of paint that requires little to no sanding is priceless. I start with a basecoat of silver for the entire gun and then work through the masking to add black on top of that later. 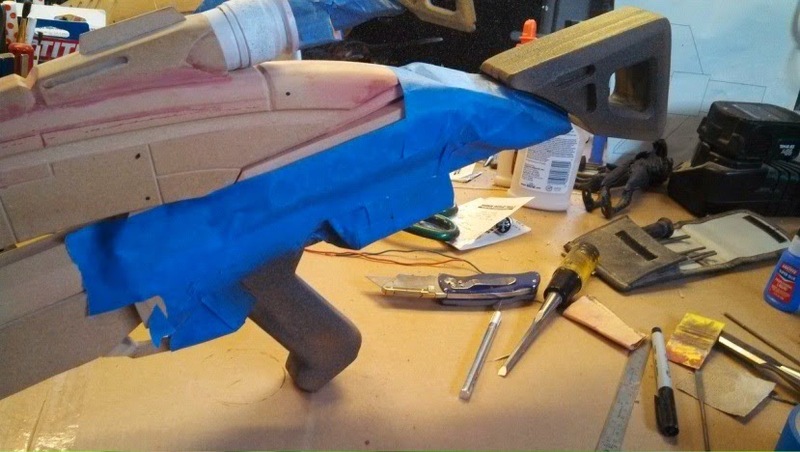 Make sure you give the paint plenty of time to try before you start with the masking tape. Nothing worse than spending a lot of hours sanding and paint and then have your masking tape leave a texture in the paint, or worse, pull the paint off. Some people prefer vinyl decals for their markings. I actually cut a template into masking tape and then place the masking tape on the prop for spray paint or airbrush. I prefer the paint method over vinyl decals because the vinyl leaves a noticeable step, where a thin coat of paint is nearly flush on the surface. It does take quite a bit more time and patience. You can also see the “assembly” screws in place here. I like to just use actual screws, usually cap head or countersunk allen screws. They only cost about $0.15 each, and it’s much easier than trying to make something that looks real. After the painting is all done, unless you want a prop that looks brand new, you’ll want to weather it to make it look a bit used. I use a mixture of airbrush, dry-brush and wash methods. The key is using different colors to give it depth. If you just use an all-black wash to weather the prop it’s still going to look a bit flat. My standard colors are silver, aluminum, and steel for the dry-brushing. I’ll use black, grey, orange, blue, red, and yellow acrylics for airbrushing and wash.
Last step is to enjoy your work! 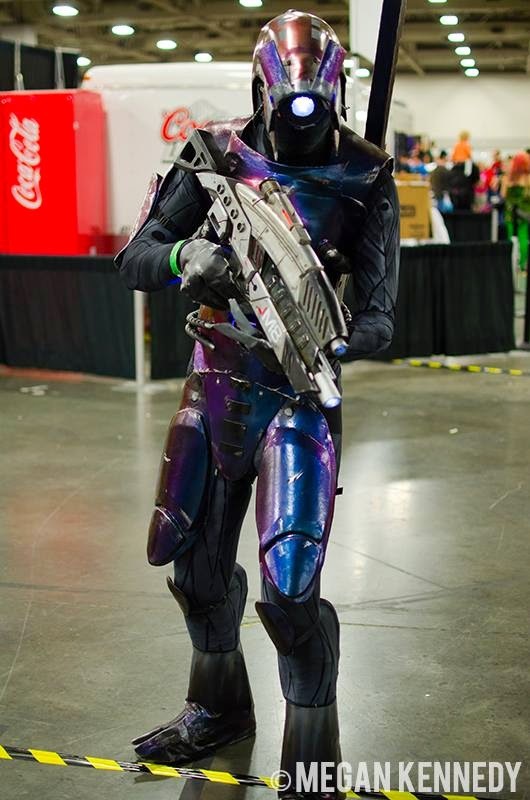 Put it on display or go cosplay!